At Christmas time, it is easy to be stressed out, anxious or worried. Sometimes, it is the burden of guilt in realising that another year has passed, and you’re far from achieving the year’s resolution to be a better you. With work and family pressures, charity must have been the last thing on your mind. But you needn’t be guilt stricken when there are still so many ways you can help! We have several opportunities for you to make this Christmas memorable and charitable. Who says you can’t have it all? You want to shop? Go right ahead! You want to give as well…? GREAT!! You can do both at the Christmas Give Back Sale! We are talking great items at great prices for great causes!! Plus entertainment for all the family, auctions and giveaways too!! Learn about how you can be a part of the Give Back Sale by visiting the event website at www.givebacksale.org and join the initiative by liking our Facebook Fanpage and following @GiveBackSale on Twitter too! All funds raised will be split between five children’s charities, including Fair Life Africa Foundation. So start gathering up those oldies, but goodies, to sell on Sunday, the 30th of December, 2012. So, go ahead, plan that lovely Christmas, Birthday or Anniversary dinner with friends and family. Be sure to place your booking with Su Chao Chinese Restaurant, at the Eleganza Shopping Mall (Victoria Garden City), though. 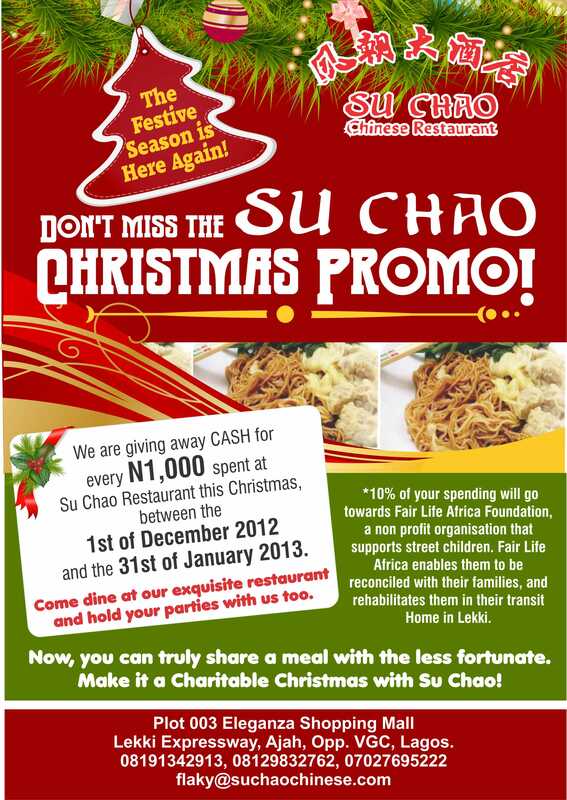 You see, from 1st December 2012 to 31st January 2013, they are giving 10% of every N1,000 spent at their restaurant to your favourite charity! You guessed right… Fair Life Africa Foundation. Now, you can have your cake and eat it too! And while you are having the best Christmas ever, do remember to stop by Fair Life Africa Foundation’s CCC Respite Home, at 2 Gbara Close, off Maiyegun (Lekki) Beach Road, Lagos, on Sunday, the 23rd of December 2012 to join in our Christmas party (from 12pm-5pm)! We also have our monthly birthday party on Saturday, 29th December 2012 (from 1pm-5pm). Derek, one of our boys, whose 14th birthday is TODAY, will be celebrating, and would love for you to come and party with him and his friends at the Home! Please bring something to share. It needn’t be big or fancy. We’ve made it easy, with some great Christmas Gift Ideas and our Donor Shopping List on our blog too. If for any reason you can’t make it for any of these…especially our wonderful supporters overseas…please take a moment to consider what you can do to make this Christmas special for your friends here at the Home. We still receive donations through our GlobalGiving UK project page, and invite you to make a donation today. GlobalGiving is actually doing its own promo, so that for every monthly donation (direct debit) set up with them this month, they will DOUBLE (yes, that’s right!) your donation in December. Make your donations go further by becoming a regular donor today. You can sign up also for monthly reminders here, thank you. Fair Life Africa Foundation is now registered with 234give.com for local donors in Nigeria. You can also donate via mobile money (08058711125), or online via our website, e-transfer or by cheque or cash deposits to our Guaranty Trust Bank account, 0106643687. Need more ideas? Would you rather give your time as a volunteer? Get in touch today. We hope we’ve made you that much lighter… Remember to join us on Facebook and follow us on Twitter too, so that you don’t miss out on anything. Drop the guilt, it’s going to be a great Christmas! Fair Life Africa Foundation wishes you a wonderful Christmas and a glorious New Year! Previous Post November’s Newsletter is Out!! At this time, more than others, the pressure to be good or to be seen as good can be overwhelming! A lot of people want to rise up and start something for charity, but usually are overwhelmed by their workload, need for rest and genuine time with family, to follow through. Wouldn’t it be great if you knew someone already in the demanding business? Glad thing you know ufuomaee! I run Fair Life Africa Foundation, and charity is my business 24/7 365 days a year. It is awfully demanding, but handsomely rewarding too. Please read this post on our official blog, The Rising Star, and see how you can help us to share the Christmas spirit, and start the new year on a high note too!! God bless you.